Summary: The days are starting to get longer and more sun is shining on those dirty spots around your house. Time for spring cleaning. Now is the time to get to all those items you have been putting off since the holidays and the New Year. Time to start cleaning what you need, organizing the clutter and storing what you can, using these 14 spring cleaning tips. Let’s gather or restock the necessary spring cleaning supplies, put on the rubber gloves and get going! 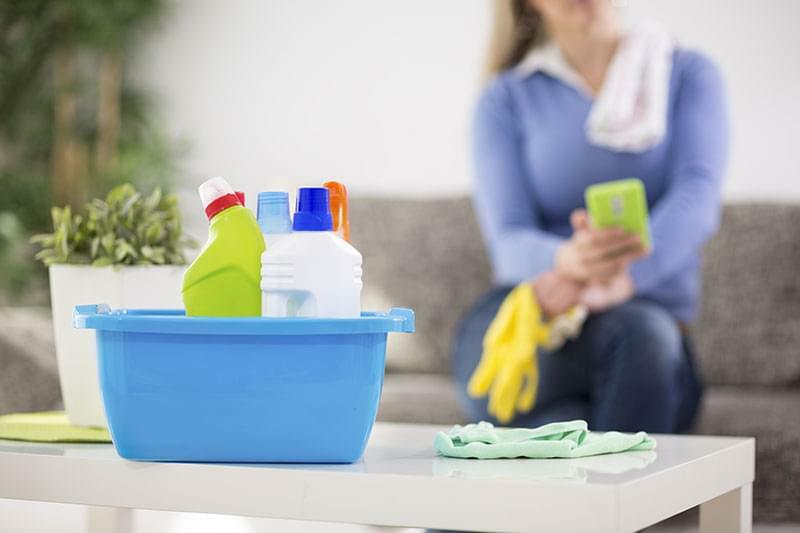 Remember to first gather your spring cleaning supplies and get the new ones you need to get started. Here are some ideas from Martha Stewart in this video on what you may need. Tip No. 1 – Remember to start top-down so you get all the dust and grime off the top of the refrigerator, cabinets and other items in the kitchen. Dust and wipe first on the top of things because you do not want stuff falling down later on your nice clean countertops and floor. Tip No. 2 – Slide the refrigerator and stove out and clean the floor under and around them. You may be amazed at the amount of dust and dog hair that can end up there. Once you have them back in place you can tackle the refrigerator. Start with those mystery food items in the refrigerator that you had the best of intentions of using some day. Throw them out, and remember that food kept too long or at the wrong temperature in the refrigerator can become contaminated with bacteria, which can cause illness. You should be wiping up spills on the shelves regularly during the year. During spring cleaning of your refrigerator be sure to wipe doors, including edges, with a cloth dampened with mild dishwashing liquid and water. Pay special attention to the areas around the handles, which can harbor sticky fingerprints. For stainless-steel surfaces, use commercial stainless-steel spray and wipe in the direction of the grain. Also clean the door seals, which can collect crumbs, with hot water and mild dishwashing liquid. Dry thoroughly with a clean cloth. Check that seals fit properly. Wipe the interior with a mix of 2 tablespoons baking soda and 1 quart hot water. Rinse with a damp cloth, then dry with a clean towel. This will clean as well as help eliminate odors. Do not use soap or detergent, because they can leave behind a scent the food will absorb. Soak shelves and bins in a solution of 2 tablespoons baking soda for every quart warm water. You can also follow Martha Stewart here on twitter. Did You Forget Spring Cleaning And The Microwave? Tip No. 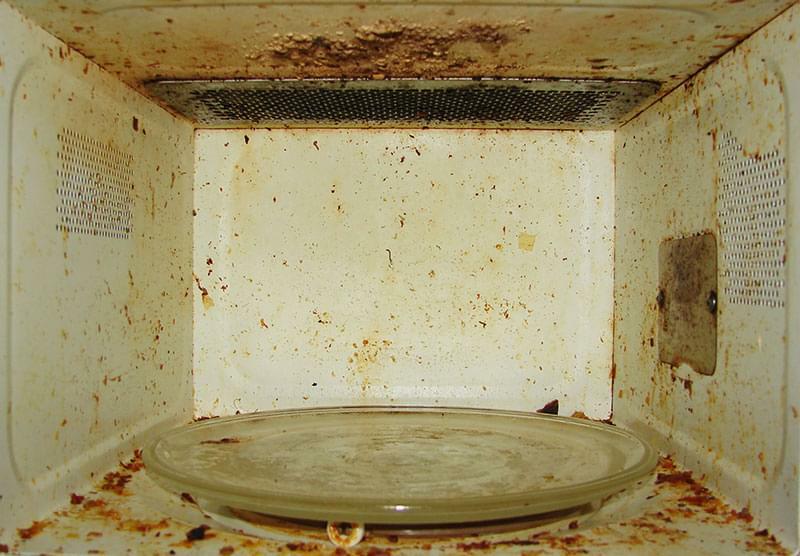 3 – Self-cleaning ovens do not need much maintenance these days, but microwaves sure do. Here are some spring cleaning tips for microwaves from the folks at Good Housekeeping. Fill a 4-cup large microwave-safe bowl with 1 cup of water and a chopped-up lemon, lime, or orange or several tablespoons of vinegar and place inside the microwave. Turn on High for several minutes or until the solution boils and the window is steamy. Let it sit to cool for 15 minutes before opening the door. Remove and wipe out inside. Clean the rubber gasket around the door with a sponge dampened with water only. 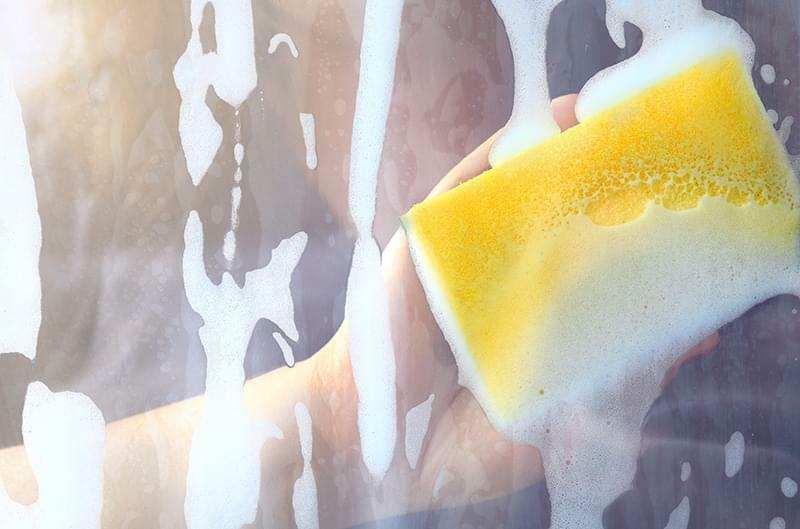 If the window is greasy, clean with a mixture of half vinegar and half water, then dry. Tip No. 4 – This is an easy one to forget because you probably think since it cleans your dishes, it must be clean, right? Over time grease, soap scum and food debris build up in dishwashers. Not only does this provide a breeding ground for germs, it also reduces the efficiency of the appliance and it can get pretty stinky at times, so here are some spring cleaning tips for your dishwasher. Use a washcloth to wipe out any loose food or scum from the bottom of the dishwasher. Use an old toothbrush and warm soapy water to clean around the seal and the edges of the dishwasher and the dishwasher door (anywhere the door covers when it is closed). Give the bottom of the dishwasher a quick scrub, as well, to loosen the scum a bit. Use the washcloth to wipe out any additional dirt you may have loosened up. Fill a dishwasher-safe dish or container with 2 cups of white distilled vinegar. Add 7–10 drops of lemon essential oil to the vinegar. Place the container holding the vinegar and essential oil in the top rack of your dishwasher. Close the dishwasher door, and select the hottest dishwasher cycle. Run the dishwasher empty for a full cycle. Tip No. 5 – Moving to the living room, it is a good time during spring cleaning to look at whether you actually need all those items. It’s a good idea to frequently declutter and move unneeded but still valued items to a storage unit. Just like in the kitchen, let’s start at the top again, dusting anything that is hard to reach, such as the ceiling fan, which probably means using a ladder. While you are up there, reverse the ceiling fan for the season to be sure the air is blowing in the right direction. This is also a good opportunity to clean your fireplace if you have one. Next, move the furniture and vacuum beneath it. Also, if you need to, clean the furniture itself. Here are some furniture cleaning tips. Dust around the room, working left to right and top to bottom. From there, you can move on to end tables, coffee tables or other surfaces. After dusting, it is also a good time to vacuum your furniture, removing and rotating sofa cushions to encourage even wear and increase their useful life. Tip No. 6 – Our homes have many different types of flooring surfaces. Here are some spring cleaning tips from Woman’s Day that may help you. Wood: Sweeping and vacuuming are usually enough to refresh your wooden floors, but for spills or stains, you may need to use a mop. Tip: When mopping the floor, use a mild detergent mixed in as little water as possible; excessive moisture can leak between the planks, causing lasting damage to the backing. Finish by mopping with plain water to avoid leaving a film of detergent on floors. Carpets: Choosing a good quality vacuum and keeping the vacuum filter clean will make all the difference when tending to rugs and carpets. For spot cleaning, always try to remove the stain using water before moving on to harsher cleaning solutions, and use a blotting rather than a rubbing motion to dab at the stain. Vinyl: Typically installed in kitchens and bathrooms, vinyl flooring is said to be a no-maintenance flooring; a quick sweep or vacuuming will keep it clean on a regular basis. Mop occasionally with water mixed with a mild detergent for a deeper clean. Tip: In order to maintain the shine and luster of vinyl flooring, coat it thinly with acrylic polish (available at home supply centers). Ceramic: Unfortunately, to keep tiles at their most sparkly, daily maintenance is necessary. Avoid the buildup of mold, mildew and grime on tiled surfaces by cleaning daily with plain water; dry tiles thoroughly with a clean towel or cloth. If grout has become stained or discolored, try mixing a solution of 1/4 cup of mild detergent with 1 gallon of water and scrub at the stained areas with a non-abrasive fabric. Tip No. 7 – Dust and vacuum the drapes, blinds and shades. Wash the windows inside and out. Again, a mixture of white vinegar and warm water is as good as any commercial cleaner. 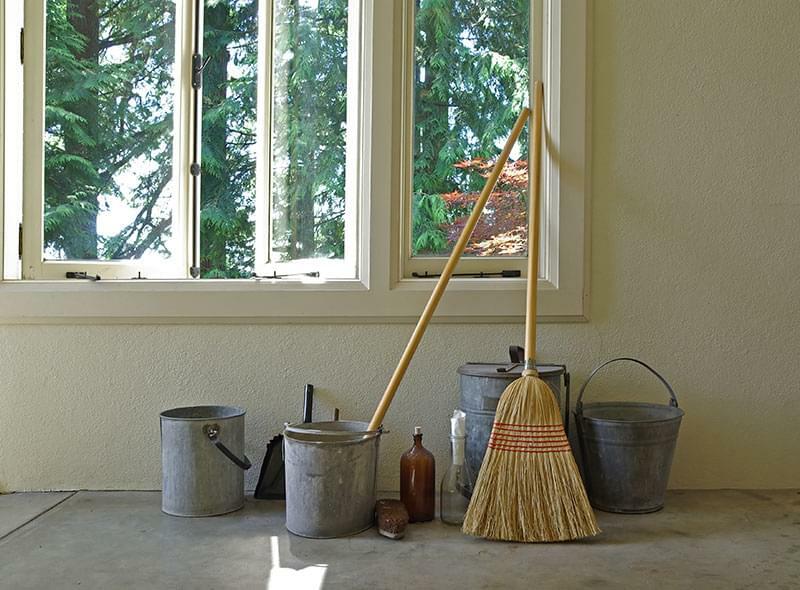 Here are some more tips from Martha Stewart on how to do spring cleaning right on windows. Use rubber-edged squeegees, which are quicker and more effective than cloth or newspaper. They come in a variety of sizes — and a screw-on extension will let you reach high spots. To start, dip a sponge into a bucket of warm water and a few drops of mild dish soap. Wet window; rub dirt away. Dampen squeegee; starting at an upper corner, draw it down pane from top to bottom. Repeat, overlapping strokes and wiping rubber edge with sponge after each stroke. (For large windows, ”snake” squeegee back and forth; then touch up edges.) Dry windowsills with a cloth. And do not forget the screens and the outsides of the windows for spring cleaning. Tip No. 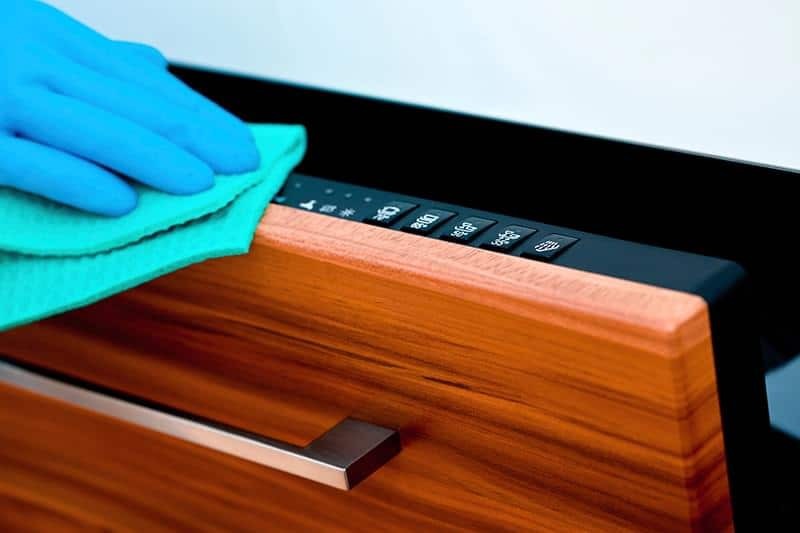 8 – Remove all screens, labeling each with masking tape and a Sharpie to indicate where it belongs, according to these spring cleaning tips from Real Simple. Next, lay screens on the driveway, spritz with all-purpose cleaner, and spray with the hose. Wipe with a dry cloth to remove dirt. Flip the screens and repeat. Air-dry. Then sweep window exteriors and frames with a whisk broom. Cleaning windows is hard, and it takes time. You can hire a professional to do it for you for about $40 to $60 an hour. A typical home can take up to six hours for window-cleaning. Tip No. 9 – When a warm, dry day does come, the first order of business is to head to each bedroom, strip down the beds, and take everything that isn’t nailed down outdoors. Hang quilts, blankets, comforters and mattress covers outside and let them bask in the sun for the day. Set up a couple of sawhorses and drag the mattress out for a good airing, too. You will be slaughtering dust mites by the millions, and a jolly massacre it will be. Tip No. 10 – Here’s a nontoxic but effective way to clean your tub this spring: Add one teaspoon of liquid soap and several drops of an antibacterial essential oil (such as tea tree, eucalyptus, rosemary or peppermint) to one cup of baking soda. Add just enough water to form a paste, and use it with a sponge or brush to scour bathtub surfaces. Tip No. 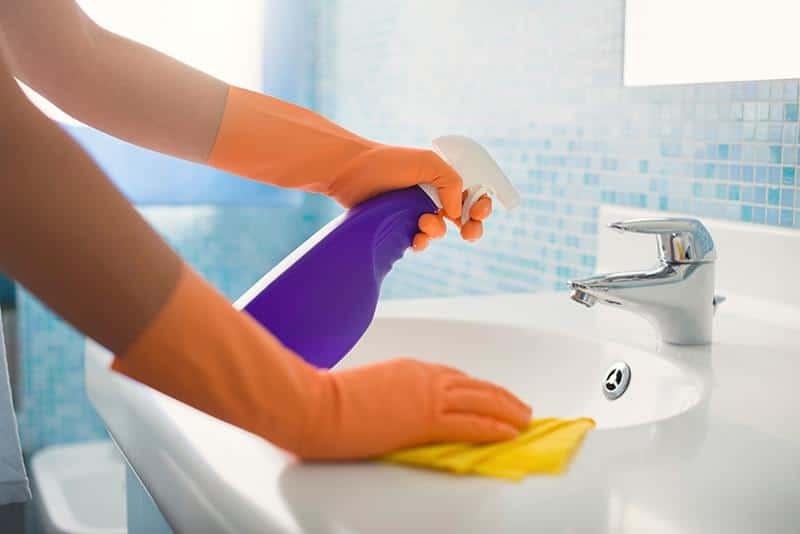 11 – Here are some more spring cleaning tips for your bedroom and bathroom. Start with organizing and eliminate all clothing, towels, wash cloths and other linens from the bathroom. Put dirty clothes in hampers, and place clean clothes in a basket to put away later. Remove all trash from the bathroom. If your bathroom trash can could use a cleaning, spray it with disinfectant and scrub it out. Of course, you will scrub the inside of the toilet with a toilet brush and toilet cleaner. But also wipe down the outside of the toilet with a disinfectant wipe or washcloth. Don’t forget the handle, hidden crevices and the underside. Wipe down the mirror with glass cleaner or vinegar. You would be surprised how many items can end up in the bathroom that don’t belong! Remove such misplaced items as stray coffee cups or jewelry, and return them to their proper places. Wipe down the sink and vanity with a washcloth and disinfectant. Pay special attention to handles and other areas with small crevices. Wipe down the insides and outsides of medicine cabinets, toiletry cabinets or other storage areas. 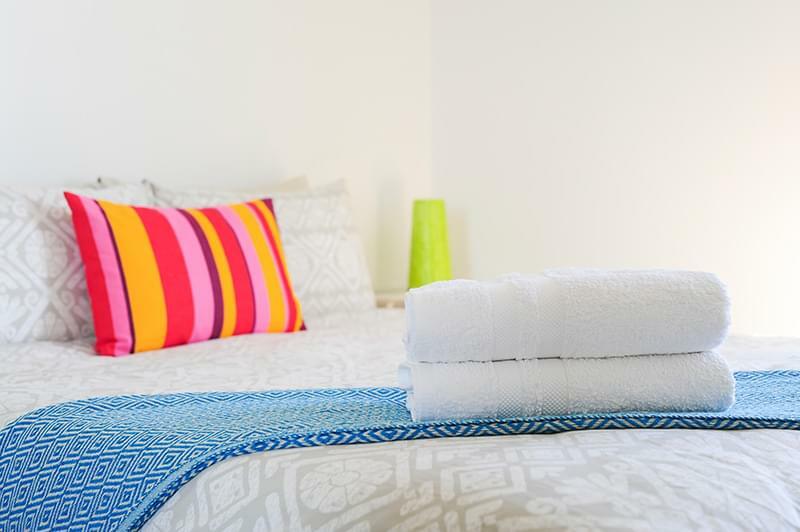 If linens are stored sloppily, take the time to refold and reorganize. Wash or shake out bathroom rugs. Sweep and mop the bathroom floor. Wipe down any baseboards. Look up and clean the ceiling. Dust corners, vents, fans and other areas that you neglect in a general cleaning. Wash and replace any decorative linens or soaps. Scrub out the bathtub, paying attention to crevices, handles and faucets. Wash shower doors, or remove the shower curtain to wash it. It might be a good time to replace a shower curtain for an easy, affordable style update. Tip No. 12 – If you have a lot of things you want to keep but they’re in the way, then it may be necessary to put some things into a storage unit. In the long run, getting rid of unnecessary clutter will make your house look neat and tidy. From bicycles to old records, Americans are collecting so many possessions they’re getting crowded out of their homes. Garages, basements, closets and attics are overflowing with “stuff” that collects dust and gets in the way. And, of course, every spring homeowners clean out that stuff, but in reality, they mostly clean around it. 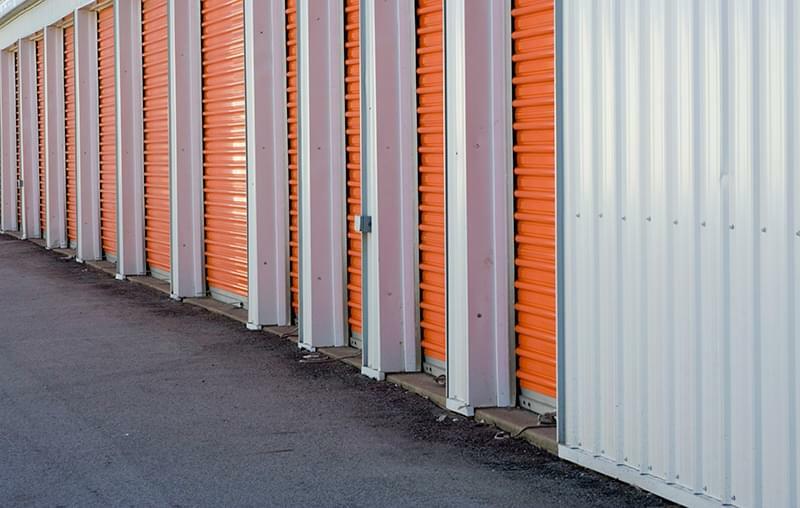 Putting all the stuff in self-storage makes the task a little easier. Tip No. 13 – Especially think about the garage. You may need to finally get those items you want to save out of there and into a storage unit so it is easier to get in and around the cars. Get rid of those boxes of stuff you have been hanging on to for too long and move them into a storage unit. A storage unit is perfect for those seasonal items you want to keep clean and tidy and close by, but you do not need to have them cluttering up your house year-round. Once you are ready to start, do not forget to go top to bottom so you get the dust and dirt down from the highest items before you vacuum the floor. Don’t forget to dust the ceiling fans as well. Then start with the kitchen and move to the rest of the house. And, do not forget the garage and what is there (some of which could go to a storage unit to unclutter your garage and your house). Whether you have a little or a lot, getting your home clean in spring is a big chore that self-storage can make a lot easier. That is because once you get everything nice and tidy, you are going to want to keep it that way.